For both sub-units a common CV Transpose input is available (1V/octave, range 0…+10V). The voltage applied to this input is added internally to CVN before the Midi note number is generated. It can be used e.g. to transpose two sequences simultaneously by one voltage. Whenever the rising edge of the Gate input is recognized a Midi note on message is generated. The note number corresponds to the sum of the voltages applied to the CVN input and the common CV Transpose Input that is present at the rising edge of the gate signal. Important note: The CV voltage has to be present at the rising edge of the gate signal. It seems that for some sequencers on the market that’s not true. If a sequencer generates the CV after the rising edge of the gate the A-192-2 will output apparently wrong Midi data because an “old” CV is taken to generate the Midi data. But that’s a problem of the sequencer, not the A-192-2. To fix this problem the A-192-2 would have to “wait” a couple of milliseconds (depending upon the delay between Gate and CV of the sequencer in question) before the CV is measured. But this would degrade the timing because then the Midi data are sent later then the rising edge of the gate signal. Please clarify if you want to use the A-192-2 with a sequencer if the CV/gate timing is correct (for the A-155 that applies of course). In Velocity mode the voltage applied to the CVV input is used to define the velocity data of the Midi note on message (in Volume mode a fixed velocity value 100 is used). As soon as the falling edge of the Gate input is recognized the corresponding Midi note off message is generated (i.e. with the same note number as the preceding Midi note on message). The voltages at the CVN and CV Transpose inputs during the falling edge of the Gate do not have an effect on the note number of the note off message ! In any case the note number of the preceding note on message is taken. Otherwise hanging Midi notes would occur ! The CVV socket is normalled to +5V, i.e. as soon as the jack plug is removed from the CVV socket the max. velocity or volume data (127) are generated. Otherwise no audible sound would be generated (because of velocity or volume = 0). The CVC voltage is permanently converted into the corresponding Midi control change message, as well as the CVV voltage provided that the Volume mode is chosen. The difference between Velocity mode and Volume mode is the function of the voltage applied to CVV. In Velocity mode the voltage CVV is used to define the velocity value of the corresponding Midi note on message and is measured only during the rising edge of the Gate input. In Volume mode the CVV voltage is permanently converted into Midi Volume messages (Midi control change #7). The CVC socket is normalled to 0V, i.e. as soon as the jack plug is removed from the CVC socket Midi control change data 0 are generated. The conversion parameters for each unit are adjusted by means of the Learn button in combination with incoming Midi data (e.g. generated by a Midi keyboard connected to Midi In of the A-192-2). The learn mode is initiated by operating the Learn button for about one second. While the unit is in learn mode the corresponding LED is flashing. The next incoming Midi note on message is used to set the Midi channel and note reference for the sub-unit in question. The voltage currently applied to the CVN socket is assigned to the Midi note number of the note message. When a Midi control change message is received while the unit is in learn mode the control change number of the Midi message is taken for CVC (except CC#0 and CC#32 as these are reserved for Midi program bank change). Program change messages are used in learn mode to select the Volume mode (program change #0) or Velocity mode (program change #1). Pay attention that the Midi channel of the incomung control change or program change messages has to correspond to the Midi channel that is assigned to the A-192-2 sub-unit in question. In addition one can switch between the two modes without the need of a program change transmitter: for this one has to operate the learn button in question for several seconds. Then the LED starts to flash faster than in the learn mode and the other function for CVV (volume or velocity) is selected. But with this procedure one has no optical feedback which mode (volume or velocity) is selected. One simply is able to toggle between the two modes. But one can find out very simply which mode is selected because the module generates continuous Midi volume data only in the Volume mode. When a variable voltage applied to the CVV socket generates Midi volume data (without a Gate signal) the Volume mode is selected. Otherwise the Velocity mode is active. The data generated by the module are transmitted simultaneously to Midi Out and USB. 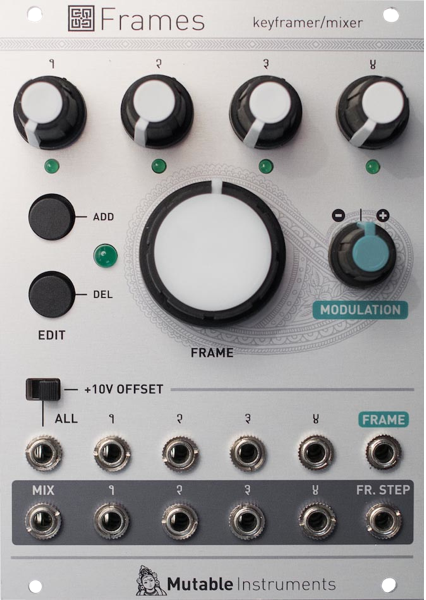 Two or more A-192-2 modules can be daisy-chained via Midi Out – Midi In. Incoming Midi data is merged to the Midi output – provided that the incoming data volume is not too high (because of the limited Midi Input buffer of the module). A Midi keyboard or a second A-192-2 are no problem but please do not try to merge a fully loaded 16 channel sequencer track. The two LEDs also display the activity of the sub-units (i.e. if Midi data are generated by the unit in question). The factory setting can be restored by operating the learn button of the corresponding sub-unit during power on (i.e. the button has to be held down while the A-100 system is turned ON). If bipolar or negative voltages have to be converted an offset generator is recommended (e.g. A-183-2). There is also an internal jumper available on the A-192-2 board that adds about +5V to the incoming control voltages CVN, CVV and CVC as soon as the jumper is installed.